Getting my four-year-old Philip to eat vegetables has been a struggle for me and my wife. He would come up with all kinds of excuses for not eating his vegetables. One thing that has been helpful is Veggie Bottoms, a fun app that promotes healthy eating by turning fruits and vegetables into animated characters. I installed it on both my iPads so that I could ask Philip to play the app with me as often as possible, but it is only one app, and I need all the help that I can get. Fortunately, now there is a storybook app with a similar goal on the App Store. Called Terri at the Market, the app focuses on changing juniors’ attitude towards vegetables through an engaging story about rescuing vegetables from their worst nightmare. Terri is a chatty four-year-old girl. She’s not a big eater, and because of this, is too skinny. The only kinds of food she enjoys are sweets: candies, chocolates, cupcakes, and ice cream sundaes. One day, Terri’s mother decides to change her daughter’s appetite for healthy foods. She takes Terri to the Farmers Market to meet Charlie, the green grocer. Charlie starts telling Terri about how vegetables have their own names and personalities: there’s Buster Brussles Sprout, Bravo Broccoli, Carol Carrot, and Mama Spuds. Terri is also introduced to Mister Mushroom, Spinach, Sorrel, Polly Pumpkin, and the Fantastic Tumbling Peas. Once Terri learns about these vegetables, she starts feeling more comfortable around them. When her mother asks her to go to the Farmers Market for the second time, she’s really excited. This time, she gets the Fantastic Tumbling Peas forming a pyramid by standing on top of each other. Then, the unfortunate incident happens. When Spinach and Sorrel sneak behind the peas and surprises them, the pyramid falls and the peas get swept up and put into a plastic garbage bag by Mabel, the Farmers Market's ceasing women. The other vegetables start worrying that the peas might be taken to the dumpster — a vegetable’s worst nightmare. A vegetable would rather be boiled, pureed, baked, or roasted than be put in a dumpster. Just then, Terri offers her help. She needs to be quick though, because a garbage truck is already approaching the dumpster. Can Terri help the Fantastic Tumbling Peas escape the dreaded dumpster? What could Terri learn from her new-found understanding of the world of vegetables? Although Terri at the Market is designed for juniors ages 3-8, parents should be aware that there is quite a lot of text on each page. Fortunately, the book is well-narrated by professionals. It is also supports five languages: English, Italian, German, Spanish, and Chinese. In addition to the storybook, Terri at the Market has four mini games that your juniors can enjoy. The first one is a color-finding game, in which you will see Terri imagining sweets in all different colors. Your juniors’ task is to tap on all the sweets that match the color of the balloon in Terri’s hand. The two other games let your juniors play with puzzles and coloring games. The puzzle game shows three vegetable characters at a time, which you need to reconstruct. 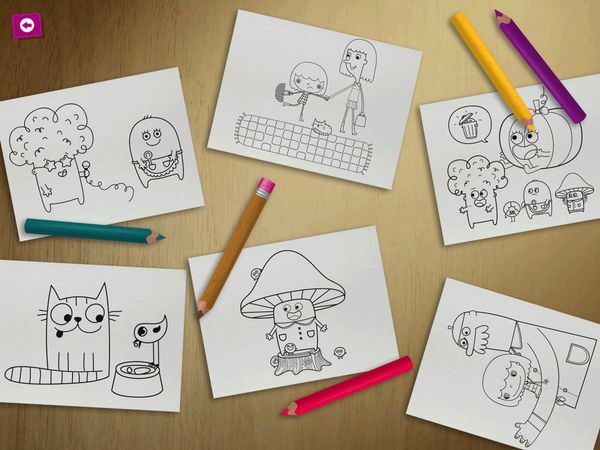 The coloring game offers six different illustrations featuring characters from the story. The final game in this app is a weighting game. Here, juniors need to find a combination of vegetables that weight the same as the mass on the other side of the scale. Because the text on each page is really long, the book uses italic fonts to differentiate dialogues from narratives. This makes it easier to follow the story. The app’s catchy soundtrack, animation, and interactivity also help make the reading experience a pleasant one. 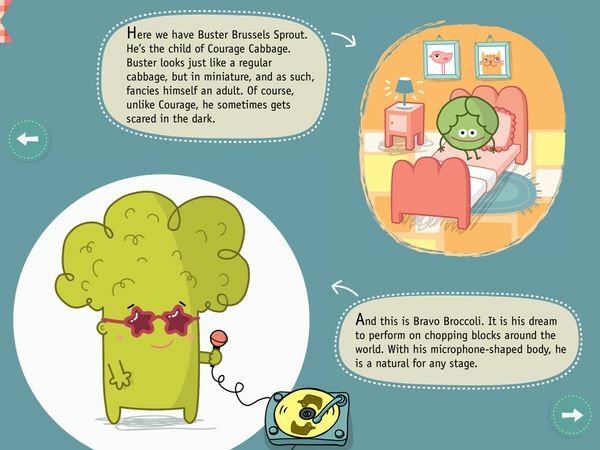 To make the story relatable to juniors, the developers added a unique personality for each vegetable. For example, Mama Spuds is like every vegetable’s second mother. If anyone has a problem, they’d come to her for comfort. Out of the four mini games, I like the coloring game the most. It features 35 color pencils, the most I’ve ever seen in an app for kids. The app uses a tap-to-fill mechanic, which is so easy, younger juniors can also use it. Terri at the Market is a lovely storybook that shows how a little girl can change her attitude towards vegetables after learning more about them. It features cute characters and a fantastic story. If you want to entice your juniors into liking vegetables, you should definitely give this app a try.